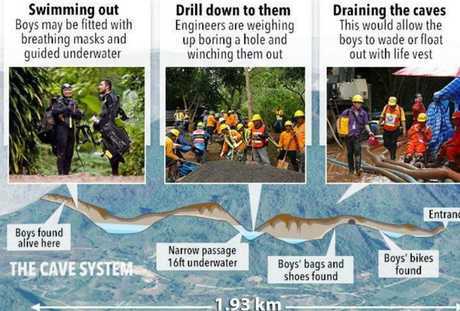 HEAVY rain forecast for northern Thailand could spell disaster for the Thai schoolboys found alive inside a flooded cave - and the situation is so dire they could be handed diving masks within hours and told to swim for it. 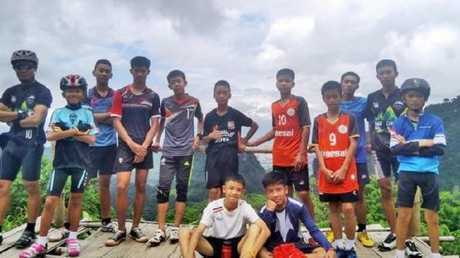 The 12 schoolboys in baggy football kits and their coach were discovered yesterday to jubilant celebrations, but it was warned that the recuse operation to guide them through the cave's 2km system could take up to four months. 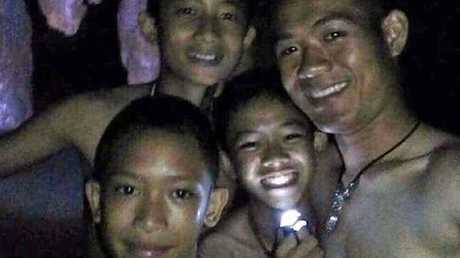 A picture of four of the twelve missing boys near the Tham Luang cave at the Khun Nam Nang Non Forest Park in Mae Sai on July 2, 2018. However, the Interior Minister Anupong Paojinda said evacuating the boys "must speed up" as soon as possible before more rain falls and exacerbates the flooding. The grim forecast could force authorities to have the children - who cannot swim - out through a narrow, underwater passage in the cave. "If something happens midway, it could be life-threatening." Mr Paojinda said. "Diving is not easy. For people who have never done it, it will be difficult, unlike diving in a swimming pool, because the cave's features have small channels." There are a couple of other options on the table if that doesn't work and the heavy rains subside. Detective Superintendent Thomas Hester said the team of six divers from the Australian Federal Police faced "incredibly challenging" conditions. While efforts to pump out floodwaters are continuing, it's clear that some areas of the sprawling cavern cannot be drained, said Mr Paojinda, a member of Thailand's ruling military junta. Having them dive out of the cave was one of several options being considered, "but if we are using this plan, we have to be certain that it will work and have to have a drill to make sure that it's 100 per cent safe," he said. "We found that most of the boys are in green condition," he said. "Maybe some of the boys have injuries or light injuries and would be categorised as yellow condition. But no one is in red condition." They also were keen to get some food. After an initial exchange in which a rescuer determines that all 13 are present, one of the boys asked what day it was, and a rescuer replied: "Monday. Monday. You have been here - 10 days." "We haven't eaten," a boy said in Thai, then in English: "We have to eat, eat, eat!" A rescuer assured them that "navy SEALs will come tomorrow, with food and doctors and everything." At the end of the video, a boy asked in English, "Where do you come from?" The rescue diver replied, "England, UK." Besides the protein drink, Narongsak said they were given painkillers and antibiotics, which doctors had advised as a precaution. He said officials had met and agreed on the need to "ensure 100 per cent safety for the boys when we bring them out." "We worked so hard to find them and we will not lose them," he said. Cave diver Ben Reymenants, part of the team assisting the rescue effort, told NBC's "Today" show that he was "very surprised obviously that they are all alive and actually mentally also healthy." While they appear responsive, "they are very weak and very skinny," he added. Reymenants said the easiest option would be to "keep pumping the water out of the cave. They need another 3 or 4 feet so they can literally float them out with life jackets." "But time is not on their side," he noted, because of the heavy rain forecast. He added that two Thai navy doctors have volunteered to stay with them for months, if needed.